Home Useful Tips How to Pay your Order in Lazada using Paypal? 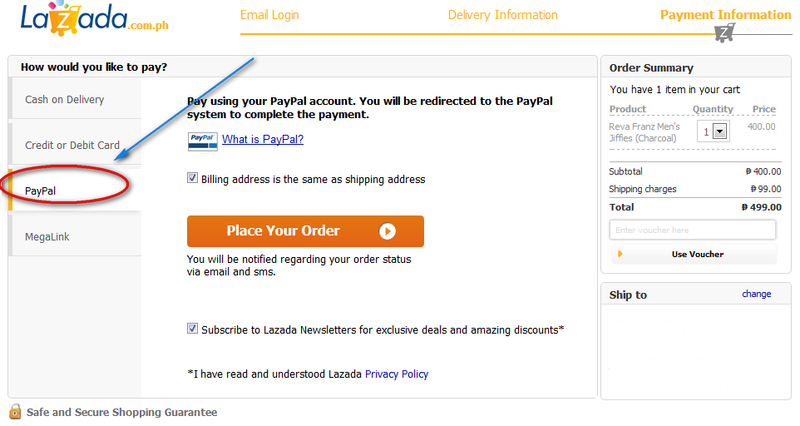 How to Pay your Order in Lazada using Paypal? I have to share with you,so far my personal shopping experiences with Lazada are great in terms of delivery and customer service. Another advantages, it offers a number of payments methods to you pay your order conveniently. Lazada accepts payments securely by Cash on Delivery, Credit Card, BDO Installment, Megalink and off course, Paypal, where I will be discussing a little bit on how to do it straightforward. 4. Click CONTINUE again if your delivery information is good to go. 5. Assuming you’re in the Payment Info page already, make sure to click the PAYPAL tab before clicking PLACE YOUR ORDER. At the right side of the page you will see your order summary with the total cost plus shipping charges. 5. Lazada will ask you to login in your PayPal account just follow the process and once complete you will receive a confirmation email regarding your payment and delivery status of your order. If you’re outside Manila you’ll have to wait at least 3 days to receive your order. Goodluck! Thanks for dropping by, please feel free to comment below.